New York City’s streetscape has been transformed — visually and economically — by the staggering numbers of vacant storefronts now dotting its most popular retail corridors. We’ve all seen the empty storefronts, and they are certainly striking. However, while the story had data on retail vacancy rates, there were no figures on retail employment or active retail establishments. I thought I’d fill in the gap. First, here’s a chart of retail jobs in NYC, courtesy of the BLS. 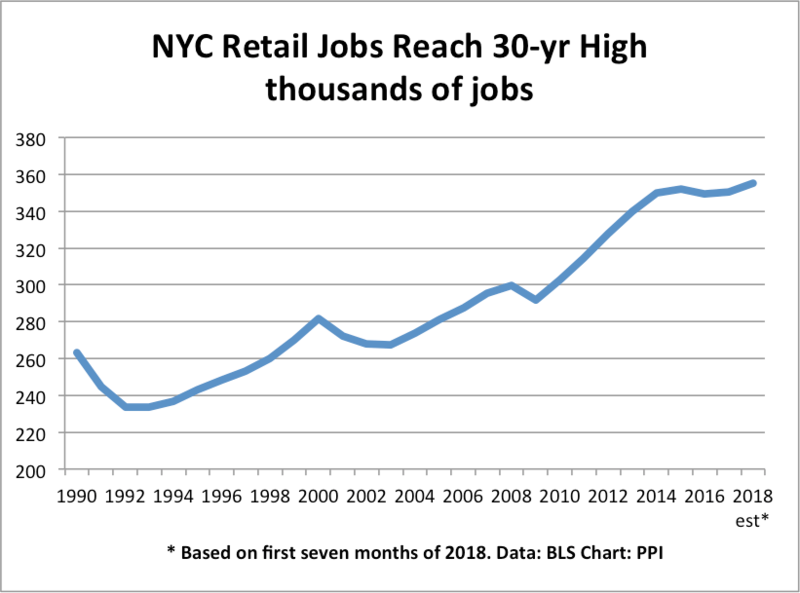 It turns out that despite the empty storefronts, NYC retail employment is at a 30-yr high. Retail jobs even rose in 2018, based on the first 7 months of the year. Retail employment is rising, in part, because of job growth outside of Manhattan. 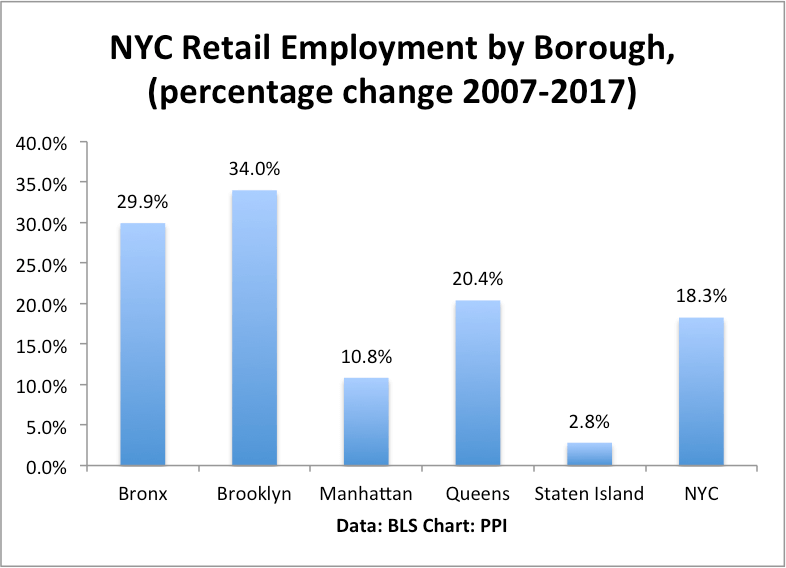 For example, retail employment in Brooklyn is up 34% since 2007. Retail employment in the Bronx is up 30%, albeit off a low base. People can now shop in their home boroughs, rather than coming into Manhattan. This is a good thing. The BLS also counts the number of retail establishments with employees. This is especially interesting, given the emphasis in the NY Times article on empty storefronts. 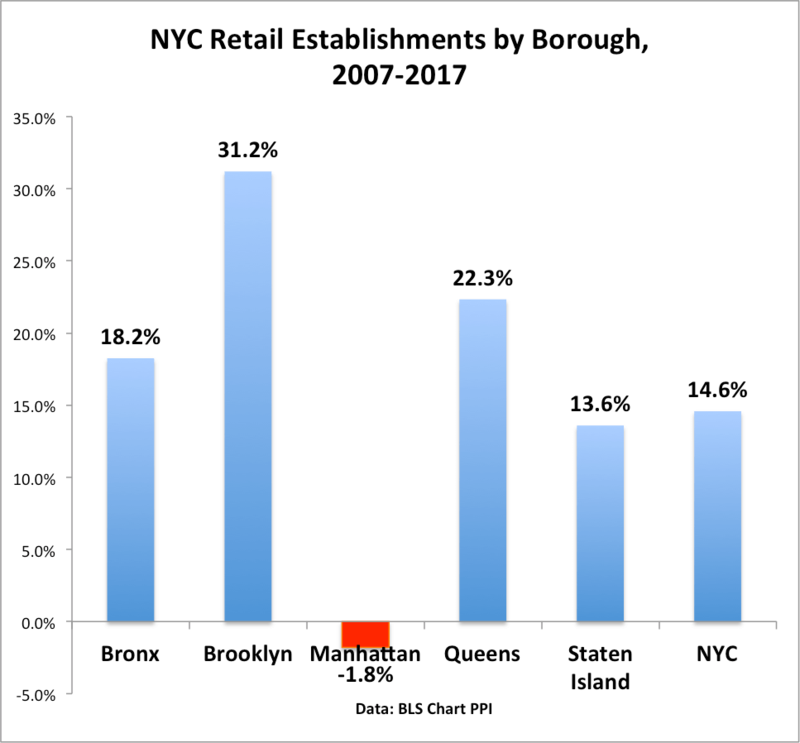 What we see is that the number of retail establishments has fallen in Manhattan since 2007. But every other borough is up significantly. For example, the number of retail establishments in Brooklyn is up by 31% since 2007. Overall, the number of retail establishments in NYC is up 15% since 2007. How can we explain this? In part, the vacant storefronts are the unintended result of prosperity. New York City has seen an enormous amount of development in recent years, including construction of ground-level retail as part of housing and office construction. That’s how we can simultaneously get growing retail employment and empty storefronts. But there’s another factor as well. Government figures tell us that retail is a low-productivity, low-pay industry (auto dealership are an exception). Real wages for production and nonsupervisory workers in retail are at the same level as they were thirty years ago. Productivity growth for grocery stores and department stores has been stunningly slow for thirty years (annual productivity growth rates of 0.4% and 0.7%, respectively, since 1987). So the piled-up mountains of imported clothing and food shipped from afar found in most stores may no longer be the best use of some of the most expensive real estate in the world. Perhaps we need to be thinking in terms of alternative uses for ground level space, like a return to light manufacturing of custom goods based on advanced technologies. That may need a change in zoning, and a change in thinking about urban space as well. But for now, realize that empty storefronts do not mean that the jobs have gone away.